This clear span gabled roof system is ideal for applications in which column free floor area is the primary consideration. We achieved maximum economy and optimum design efficiencies within the GE-T’s interior frame through the use of variable-depth sidewall columns and rafters. We have extensive experience in meeting customers’ requirements for extra-wide systems such as large aircraft hangars and sport/show arenas. The GE-T is economical for a wide range of widths and heights in which column free floor area and large bays (up to 30 ft.) are required. It is fully adaptable to building projects using collateral walls. The transverse sectional dimensions are intended for use during the building planning stage and are based on: width, height, loads as charted, roof slope of 1/12, and bay spacings of 25’-0”. 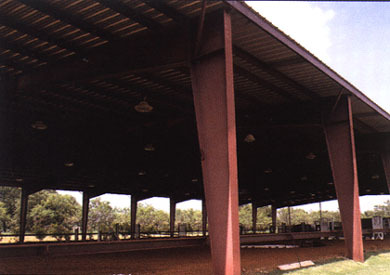 These dimensions will vary when: different design criterias or other loads, open or partially open walls, width extensions, canopies, overhangs, etc., are supplemented to the system. For more information, you can follow this link to view the Transverse Section Specifications for the GE-T System. 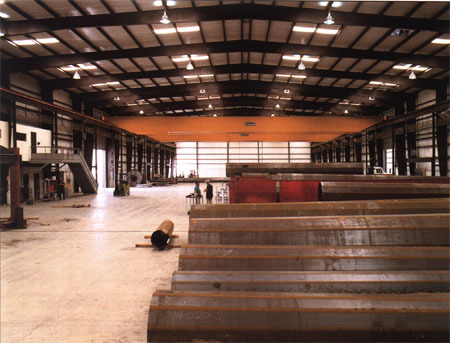 © Copyright 1999-2014 Tatum Steel Buildings Corp.